Prisms Communications : : TopSchool School Management System, College Management System, WebApp Development. It's all in the cloud ! From our inception, we believe in taking education to the next level. The more sorted it gets, the more is its output. Be it home-work assignments or parent-teacher meet invites or exam timetables, this feature allows mass notification. So one single post conveys a message to every parent. The service encompasses a variety of platforms – parents can receive updates through SMS, E-mail or through the Android App. Admission process is usually characterised by long queues and mishandling of data. This feature enables you to enter data online, in defined categories. Relevant documents can also be scanned and uploaded. The greatest advantage school management gets is that a complete student database simultaneously created. Attendance records are the most tedious ones to maintain. Moreover, any discrepancy can lead to incorrect data processing. Attendance Management gives you the comfort of taking attendance through a few clicks. 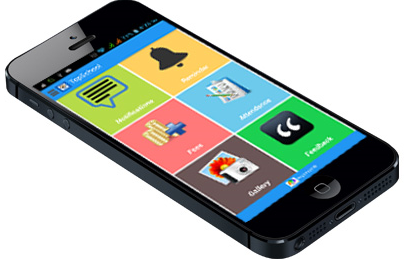 Attendance of each day can be saved and reports can be furnished easily. The feature also alerts parents if their pupil is absent on a certain day. Though most schools administrations are computerised now, database management still remains a challenge. The Reports feature synchronises all the data of a school – so a student’s attendance, his/her fee records and academic performance are streamlined. In addition, administrative records like general register and school expenditure can be maintained. Neat and focussed reports are generated in Word as well as PDF format and can also be shared. As schools grow in expanse, their staff number also grows. Specialised teachers, lab assistants, non-teaching staff...there is a person for every job. It gradually becomes difficult to maintain a tidy record. HRM is especially designed to assist the HR department. Staff records like attendance, salary, leaves and promotions are easily documented. You create a trustworthy database and processing system. From I A to X F, there are numerous classes in a school. And every day, there are several periods shuffled between a number of teachers. There are obvious lapses and changes in the schedule. This feature alerts parents in advance so that the students can carry the right books and notebooks. It also finds a free teacher for a free period, so that the vacuum can be timely filled. Like admission, fees payment and collection is a physically tiring process. Fees Management feature cuts the queues and allows payments online – through internet banking, credit and debit cards. Pre-set alerts will notify parents about due dates through SMS. School administration will also get detailed reports about pending dues, total collection and other relevant details. This infrastructure management feature is aimed at systemising the transport facility of a school. It gives both, timetable updates to parents as well as alerts in case of breakdowns or other discrepancies. The feature gives complete peace of mind to parents and keeps the school management records accountable. Every good system has its last step as feedback. This way, the service becomes circular rather than just linear. Feedback Management feature brings parents, teachers and school management on a single dais. It facilitates problem solving through online conversation. The thread can also be followed up with solution and school can keep this as a record. Parents can also book appointments for face to face meeting through this feature. Highly customisable, this feature takes the complete responsibility of processing results for a school. All teachers have to do is enter the marks of a student for the respective subject. This feature will calculate the total, process the percentage and print the report card on the web portal. The results will also be conveyed to parents through SMS. All those heavy files in your office are reduced to a few MBs by our Doc Management feature. The LCs and Bonafide Certificates can be generated and easily printed with this feature. The templates ensure that you don’t have to repeatedly go through the process of drafting. The automated system means that every record in vigorously maintained. TopSchool App : Where School and Parents work together for better future of students. The app provides extensive features such as to view notifications sent by the school to the parents, view fee details,view photos of all special events shared by the school, school calendar, set reminder for special events/activities, view and keep track of your kids attendance and provide feedback to the school. A view of your child's progress is now just a click away. 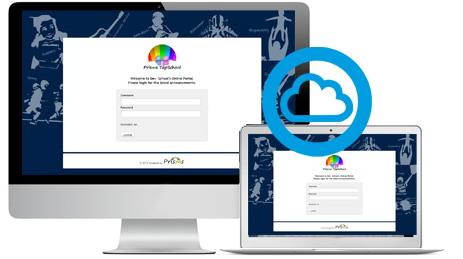 Topschool provides dedicated login session for the parents where parents have access to their kid's attendance, marks, class tests, notifications from school,list of holidays, gallery of photos of special events help at the school and school timetable. Parents can also provide feedback or issue a query/request to the school.